Was this question wrongly marked as an exact duplicate? 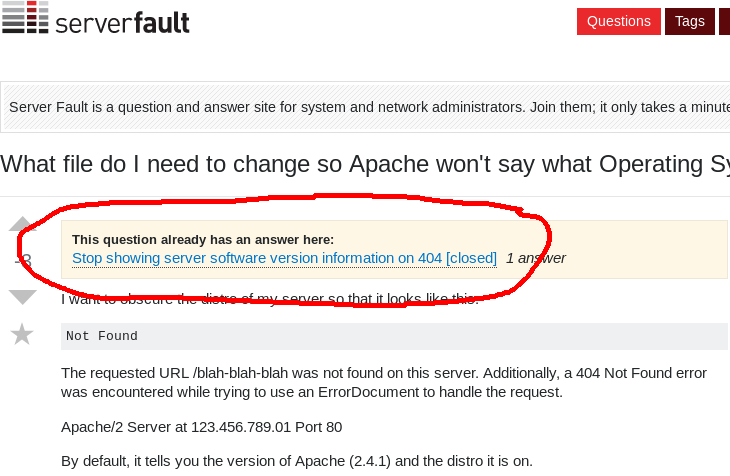 I have a question about my Server Fault post: What file do I need to change so Apache won't say what Operating System I am using? Several users had marked it as an exact duplicate, so I tried to search for a similar question, but was not able to find anything that resembled the question I asked. I asked for a link to be provided, to which there was no response. I'm wonderinf if this question was marked so that they wouldn't have to answer it, even though it was not a duplicate? The link to the duplicate is displayed below the title and above the body. Michael already showed you where to find the link so I will respond to your assertion that your question was wrongfully closed. What are the canonical answers we've discovered over the years? Why isn't the quote button working correctly here? a moderator closed my question is any one watching. Should this question be a duplicate? If not, how do I unduplicate? Do the review audits expect me to recognize an answer as a duplicate without seeing the other answer? Older Question is a Duplicate of a Newer Question? What is the etiquette here regarding duplicate posts? What is the difference between these two questions? Why was one closed and the other left open?